Resembling a headless horse with two inward legs, a robotic transport system named AlphaDog is expected to be complete this year. The compelling yet creepy android packhorse from Boston Dynamics is being developed with funding from DARPA and US Marine Corps. The robot is capable of carrying 400lbs of payload over 20 miles of rough terrain. The invention has obvious application for anyone who works outdoors. 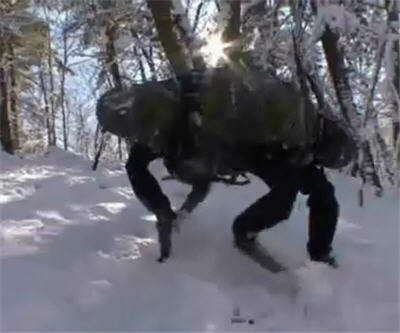 The robot can stumble across ice and climb tree-covered hills. It can also fall over and get back up. YouTube videos tracking the progress of the invention have gone viral. A video from last year, embedded below, has been viewed 1.3 million times. Commenters, however, have mixed emotions about the invention. "KILL IT WITH FIRE," wrote Muffinmixable. "Look! A walking vuvuzela!" wrote theownerwanabe, commenting on the androids loud industrial buzzing. Boston Dymanics says the engine on the latest prototype is much quieter. Boston Dynamics, a spin-off from the Massachusetts Institute of Technology, is an engineering company specializing in robots. It was founded in 1992.